What is the best way to backup WhatsApp chat? If you have the same question in mind, then you are at the right place. While WhatsApp is used by over a billion people worldwide, most of them struggle with ways to backup their data. Surprisingly, people don’t know that there are numerous ways to do WhatsApp backup iPhone or Android besides the native solution. In this guide, we will let you know about 5 ways to save WhatsApp data. Let’s explore these solutions in detail right here. This is certainly the easiest and the most reliable way to save your WhatsApp data directly to your PC. The Restore Social App is available for both iOS and Android toolkit of dr.fone and comes with numerous features. It can help you backup WhatsApp chat all at once with a single click. 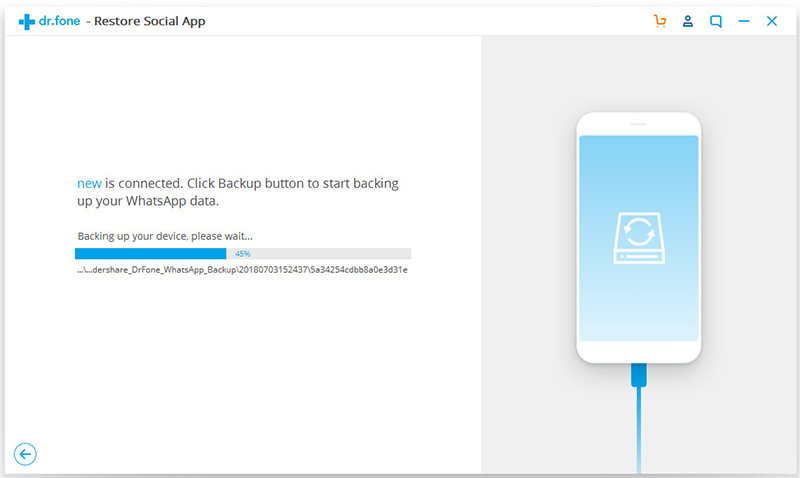 If needed, you can load the backup to preview its content and later restore it to another device or export it to your PC. 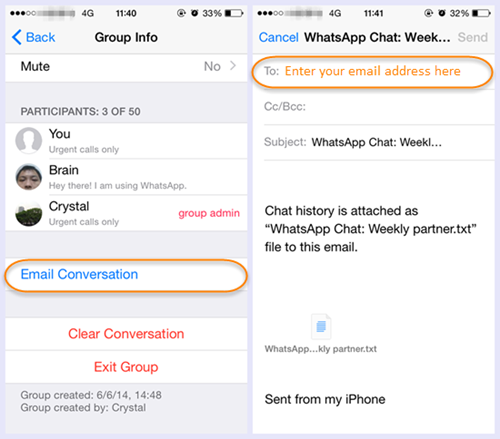 The tool can also directly transfer WhatsApp data from one phone to another (like iPhone to iPhone/Android). Firstly, launch the dr.fone toolkit and visit the “Restore Social App” section from its welcome screen. Also, connect your iOS or Android phone to your system. From the next screen, visit the “WhatsApp” section and choose to backup your data. 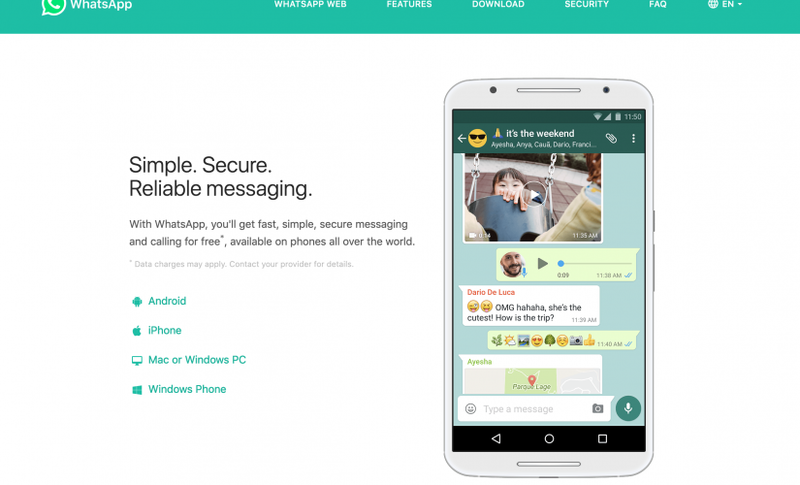 The application will start saving your WhatsApp chats, photos, videos, and other attachments. Simply wait for a while as the backup would be processed. In the end, you will be notified when the process is successfully finished so that you can view the backup content. There is also a provision to restore WhatsApp backup data to the same or another phone as well. 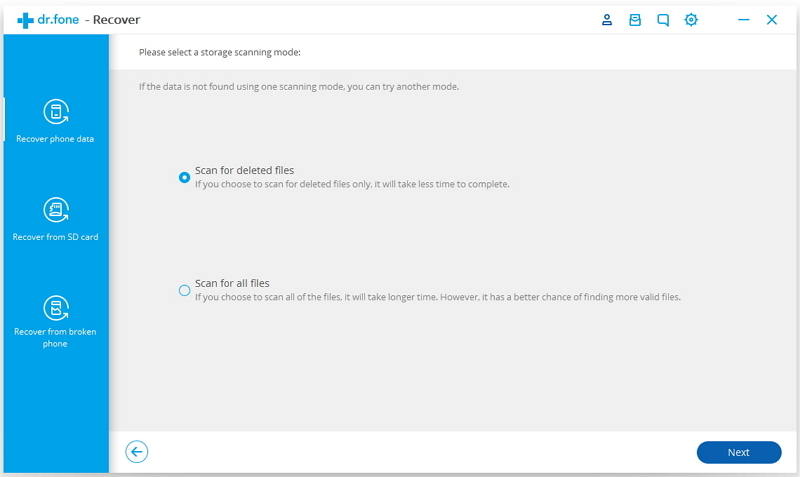 You can select the data of your choice and restore it to the target device or save it on your computer. In case if you wish to backup WhatsApp chats selectively, then you can take the assistance of dr.fone – Recover (iOS/Android). It is a complete data recovery solution that can extract the existing as well as the deleted WhatsApp content from your phone. Since the application will let you preview your data first, you can perform WhatsApp backup iPhone or Android selectively. The application can also be used to extract lost or deleted photos, videos, contacts, messages, etc. from your phone. 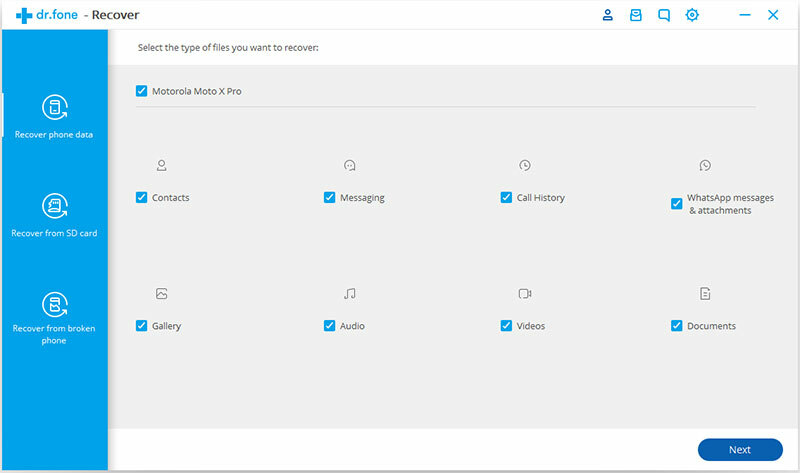 To start with, launch the dr.fone – Recover (iOS/Android) application on your system and choose to restore data from your device. Connect your phone to the system and select the “WhatsApp messages & attachments” option to proceed. From the next screen, you can select if you wish to scan the entire device or look for only deleted content. Wait for a few minutes as the application would scan your device and look for all the WhatsApp data in it. 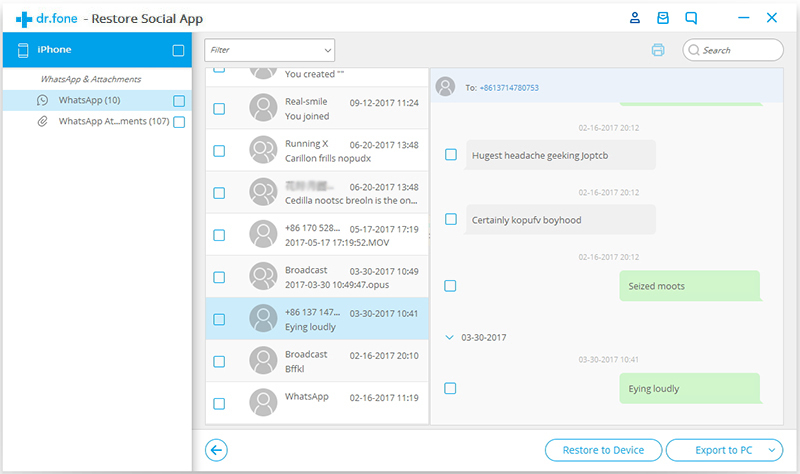 Once the process is completed, you will be notified so that you can preview the extracted WhatsApp chats and attachments. Make the needed selections and directly save your WhatsApp data to your computer. 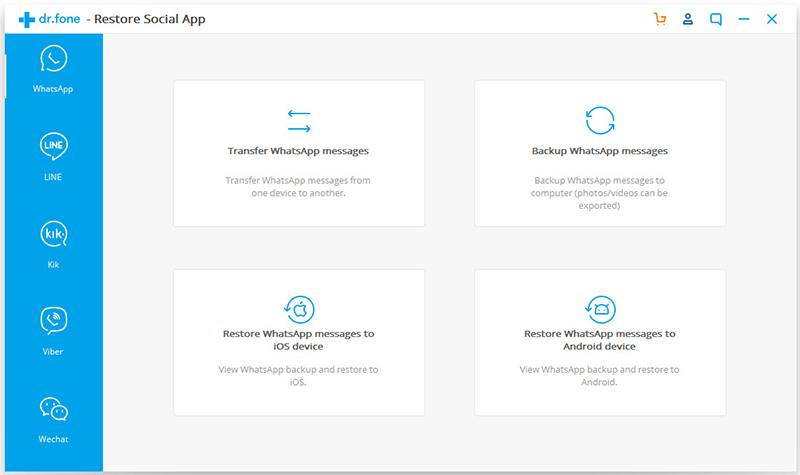 This is a native solution to backup and restore WhatsApp data on Android devices. You can link your Google account to WhatsApp and take its backup on the drive. Though, there is no option to preview your data or save it selectively. Also, when you restore it, the entire WhatsApp data will be transferred. Furthermore, the existing WhatsApp content on the target device would be erased in the process. Launch WhatsApp on your phone and visit its Menu > Settings > Chats > Chat Backup. 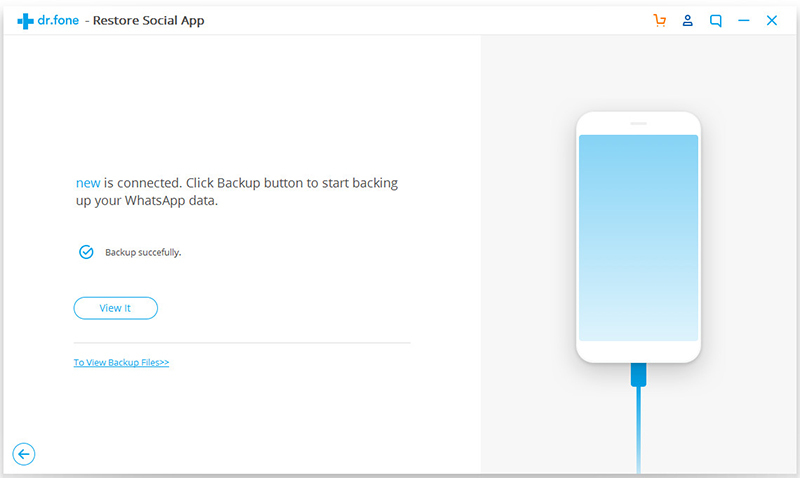 Make sure that your Google account is connected and tap on the “Backup Now” button. You can also enable the option to take automatic backup from here. 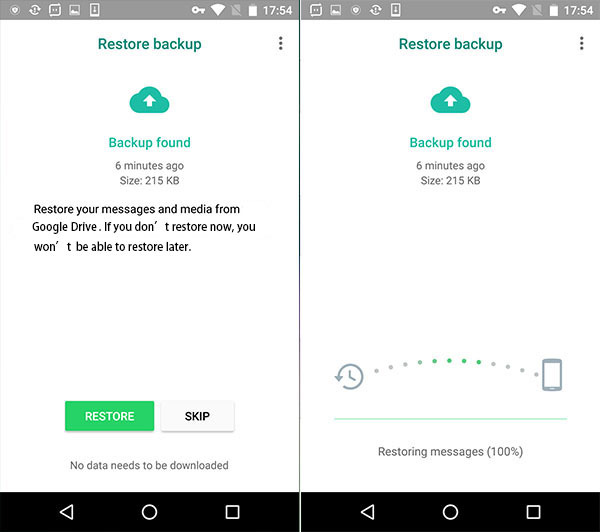 Once the backup is saved, you can restore your WhatsApp chats as well. Reinstall the WhatsApp app on the device and make sure the phone is linked to the same Google account. While setting up WhatsApp, enter the same phone number. 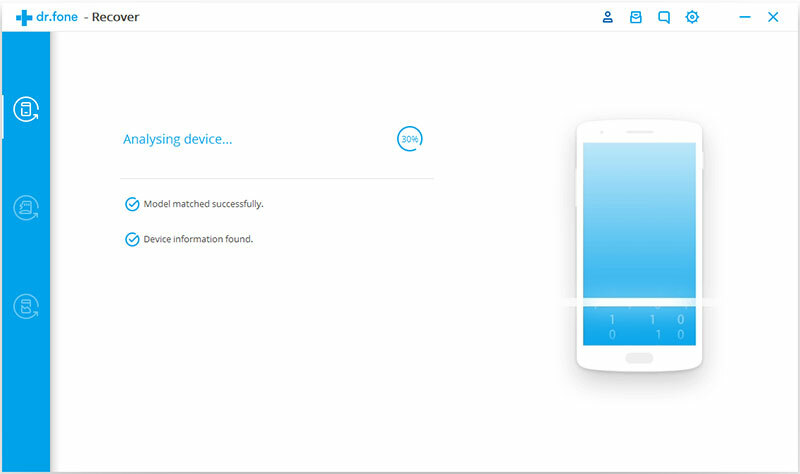 The app will detect the presence of an existing backup and let you know. Just tap on the “Restore” button to get it back. Similar to Android devices, iPhone can be linked to an iCloud account. You can do WhatsApp backup iPhone on iCloud and later restore it too. Though, the target device should be linked to the same iCloud account and the identical phone number has to be used while setting up WhatsApp. Before you proceed, just make sure you have enough free space on your iCloud. 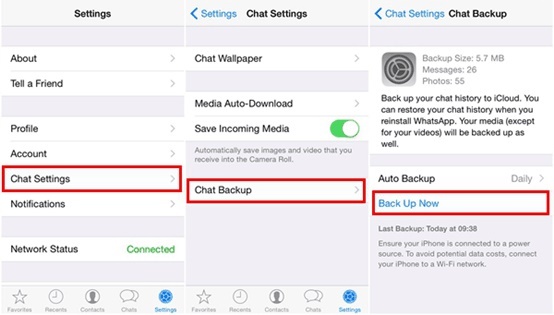 Go to WhatsApp Settings > Chats > Chat Backup on your iPhone and tap on the “Backup Now” button to take an immediate backup. You can choose to include/exclude videos in the backup or turn on the automatic backup feature from here as well. To restore WhatsApp data, reinstall WhatsApp on the target device and link it with the same iCloud account and phone number. As the existing backup data would be detected, click on the “Restore Chat History” and wait for your backup to be restored. If nothing else would seem to work, then you can simply email WhatsApp chats to yourself as well. 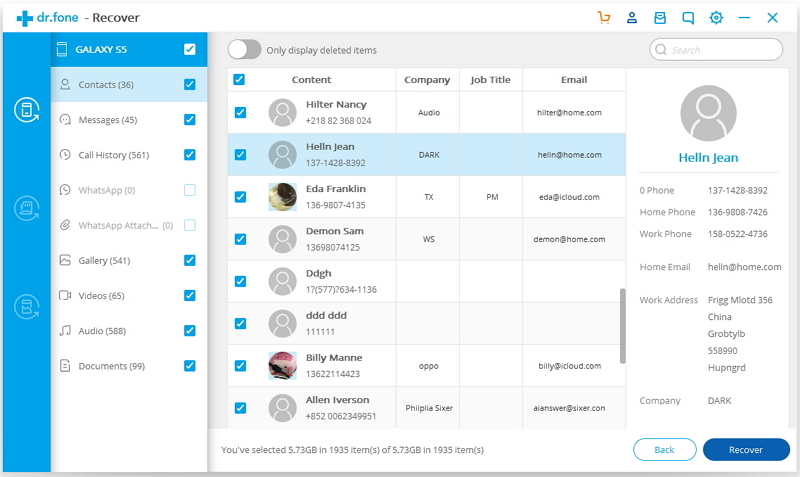 Needless to say, this is a more time-consuming solution and will let you save selective messages (without including every attachment) due to the restricted size limits of emails. Simply select a WhatsApp conversation that you wish to save and go to its more options. From here, tap on the “Email chat” or “Email conversation” feature. As the default email app would open, enter your own email id and wait for the chat backup to get attached. In the end, just email the conversation to yourself or trusted contact. 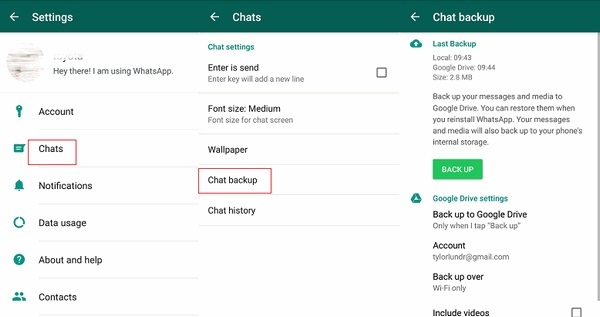 Now when you know 5 different ways to backup WhatsApp chats, you can easily keep your data safe. As you can see, dr.fone – Restore Social App provides a fast and secure solution to do WhatsApp backup iPhone and Android. In case if you wish to take a selective backup, then dr.fone – Recover (iOS/Android) can be used as well. Feel free to use these utility tools and never lose your WhatsApp chats unexpectedly.